Berlin Wall – Small fragment of concrete from the Berlin Wall, which was both a physical division between West Berlin and East Germany as well as a symbolic boundary between democracy and communism during the Cold War. The Berlin Wall was erected in the dead of night on August 13, 1961. 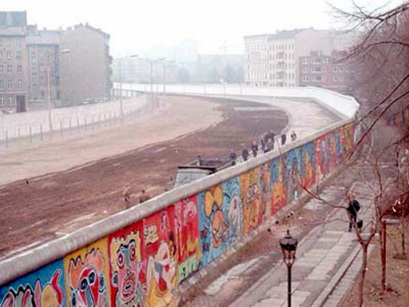 The wall stretched over 100 miles, and ran not only through the center of Berlin, but also wrapped around West Berlin, entirely cutting West Berlin off from the rest of East Germany. It initially consisted of a barbed wire fence with concrete posts, but over time evolved into a complex deterrent system to prevent East Germans from emigrating to the West. By the time the wall fell in November of 1989, the wall “system” consisted of an outermost wall that was a 12-feet high by 4-feet wide Concrete barrier wall with a smooth pipe running across the top to hinder people from scaling the Wall, as well as a 300-foot No-Man’s-Land, an additional inner wall, soldiers patrolling with dogs, a raked ground that showed footprints, anti-vehicle trenches, electric fences, watchtowers, bunkers and minefields. Specimen owned is a fragment of concrete from the outermost wall, and is approximately 3¼” x 1¾“ x ¾” . A certificate of authentication No. 16447 issued by Jens Wordelmann accompanied the specimen.